[CONT](VC) Generation Break 2 (This ability is active if you have two or more face up G units in total on your (VC) or G zone):During your turn, all of your units in your front row get [Power]+5000. [AUTO](VC):[Counter Blast (1)] During your turn, when your G unit Stride, you may pay the cost. If you do, choose up to two cards from your hand, call them to separate (RC), choose up to two of your units, and those units get [Power]+5000 until end of turn. 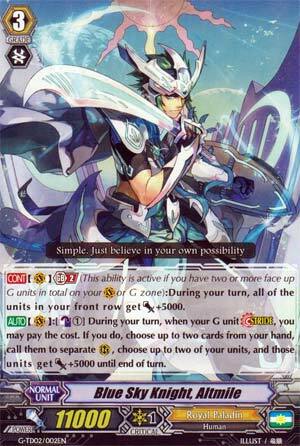 Here's the second of the Trial Deck ace Grade 3s, Altmile. His Generation Break 2 skill is to give your entire front row 5k during your turn, and like Chronojet, he has an on Stride skill, which costs 1 Counterblast, and for that, you can superior call up to two from the hand, and give two rear-guards 5k until turn's end. Note that you don't have to choose the units you call to receive 5k, or even call anything at all; you literally could just Stride, select 2 existing units, and give them 5k, right away. So, what we have is a constant Soul Saver Dragon when you Stride. That's not bad, as far as skills go, it's basically a mini Gancelot without the weakness of a poor field screwing it. I think this is a little better than Chronojet's on-Stride skill since it's more damage in if you hit and it forces away 10k more guard lost potentially if the opponent blocks it all, which goes a little further than Chronojet's field wiping. As for powering up with GB2, as I mentioned yesterday it's a bit slow and I can certainly name other decks that can achieve the same columns faster. But the main reason it doesn't really make me go YES MORE OF THIS WAWAWAH because it highlights how dependent on formation Royal Paladin is. Or at least this build of it, anyway. Chronojet could at least end a game by himself if you're in trouble, but Almtile lacks the capacity to summon any new units himself and be proactive. Luckily Knight of Twin Sword exists, but I'd rather not use a gambit assuming I'm losing. Altmile needs a very dedicated build for him to shine. And I suspect I'd still rather use Seekers, to be honest. Why couldn't it be Altomile? ...Okay, I guess that's too close to Malt-o-meal. Anyway, this is the new Royal Paladin boss. According to the lore, Altmile grew up at the border of the United Sanctuary and the Dragon Empire and lived with the stories of a Legendary Royal Paladin in his heart. With that belief in him, he grew to become an elite commander of the Royal Paladin army and protects the border between the Dragon Empire and United Sanctuary, fending off any invasion from the Dragon Empire. When you stride with Altmile in the Heart, you can CB1 to superior call two units from your hand to the field and those two units get +5000 each. Considering how good Royal Paladins are at Superior calling in the first place, this is almost pointless since you'll probably have a full field by the time you do Stride. Oh well, always nice to have the option, I suppose. GB2 is an enhanced version of Brutus's Legion ability. Not too bad, it allows rear guards to hit high numbers, which is what Royal Paladins have done since forever, only downside is that Altmile is quite a bit weaker than nearly any Royal Paladin legion over-all. Then again, I haven't looked at the deck fully, so I can only comment how it is in a vacuum. I'm probably looking at it wrong, but right now, Altmile doesn't seem too good, I'd rather stick with the Legions (Seeker, Jewel Knight and Ezzell) over Altmile. I suppose that Altmile is pretty good for a non sub-clan boss though, seeing as he won't have 10 and 12K beaters to work with as easily as Seekers or Jewel Knights have. Still, if you're not going Legion and going pure Stride, use this guy. Find yourself a good back-up boss though.